The name of the Swinhoe’s Snipe pays tribute to the English naturalist Robert Swinhoe, who described this species for the first time in 1861. This species is also named Chinese Snipe and Forest Snipe. 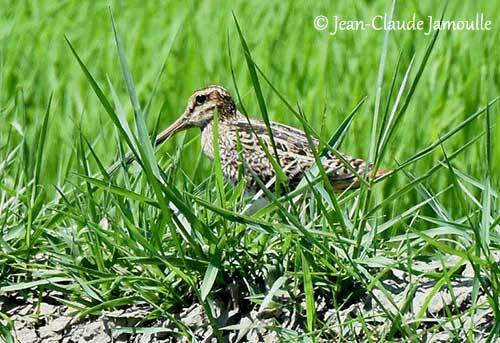 The Swinhoe’s Snipe is a medium-sized snipe, with all the typical features of Gallinago species. It breeds in C and S Siberia, and winters from S China, E to S India and Sri Lanka. It is vagrant in some regions of SE Asia. It frequents the wet areas and their margins, usually near the forest, between 600 and 2100 metres of elevation. The flight displays are reported in May/June, and like in other snipes, this flight is spectacular. 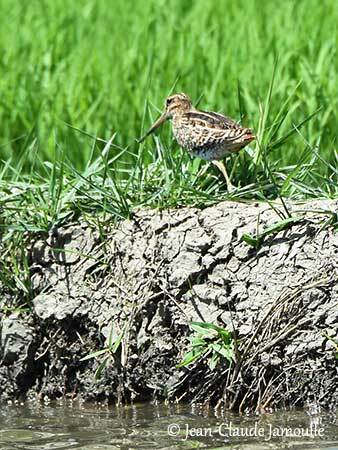 The Swinhoe’s Snipe is not globally threatened, although it may be affected by habitat loss, especially the staging areas in E Asia where the intertidal areas are modified for aquaculture, and mainly in the Yellow Sea. The Swinhoe’s Snipe is very similar to Pintail Snipe and Latham’s Snipe. 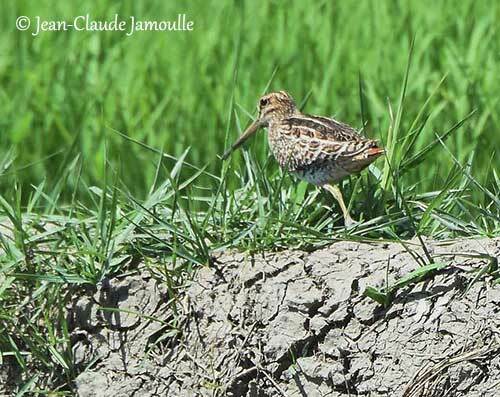 It has the typical cryptic plumage of snipes, with brown and white upperparts showing scaled or scalloped pattern formed by the pale-edged feathers. A yellow broad stripe passes on each side of the back. Rump and uppertail are blackish with yellowish streaks, whereas the uppertail-coverts are yellowish with black stripes. The central pair of rectrices has black base and rusty terminal band. On the upperwing, the flight feathers are greyish-brown with narrow white tips to secondaries. The tail is rounded and the wings are pointed. The underparts are brown and white. The throat is whitish. Foreneck, upperbreast and flanks are yellowish with dark streaks, whereas lower breast and belly are white. The undertail is yellowish with dark bars. On the head, crown, forehead and nape are buff with brown stripes. The long bill is horn-coloured with black tip. The eyes are dark brown, surrounded by buffy-white eyering. Legs and feet are greenish-yellow. The female is similar, but she has slightly longer bill. There is no seasonal variation in plumage, but the birds are much paler and more mottled in spring than in autumn. The juvenile resembles adult, but it has wing-coverts and tertials finely edged buffy-white, and the tertials are barred buff. The Swinhoe’s Snipe breeds in C and S Siberia and N Mongolia, Amurland and Ussuriland. It winters from S and E India to E and S China and Taiwan, and S through Malay Peninsula, Philippines and Indonesia to New Guinea, Melanesia and N Australia. The Swinhoe’s Snipe breeds in moist forest clearings or boggy areas. 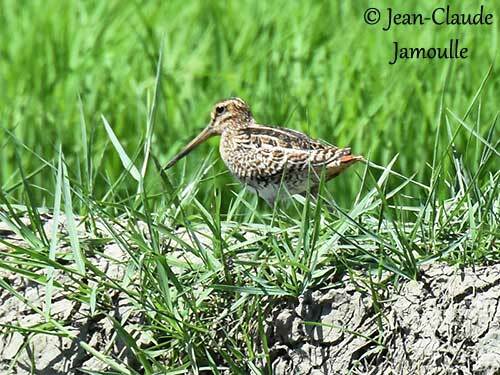 It is mainly found in open woodland along river valleys, usually in drier sites than the Common Snipe. Outside the breeding season, it frequents similar habitat types and occasionally the edges of marshy areas and paddy fields, or freshwater streams. This species may occur up to 3000 metres of elevation in Bhutan, and to 3700 metres in New Guinea outside breeding. The Swinhoe’s Snipe is usually silent when flushed, or it utters a single “scaap”. The aerial display by the male produces a loud, rushing sound “ssseeeuu” of air through the tail featehrs during five seconds. This flight is accompanied by repeated rasping, nasal, creaking sounds. It also gives a repeated “tchiki” from ground, perch or in flight. The Swinhoe’s Snipe feeds on worms, insects and small molluscs. Insects include beetles and ants (adults and larvae). Small molluscs are mainly earthworms and terrestrial gastropods. It also consumes seeds. It forages by probing the mud with its long bill, and it detects the prey by touch with the bill’s tip. It forages solitary, both day and night, in the grassy wetlands and the margins of pools. At the beginning of the breeding season, the male performs spectacular aerial displays, usually at dusk. It gradually ascends, and then it glides on outstretched, motionless wings, and continues with rapid wingbeats in order to rise up to 30-40 metres into the air. At this point, it circles horizontally, alternating active flight action and glides. Then, it descends in steep, arc-shaped route on half-closed wings interspersed with bursts of shallow wingbeats, descending to 10-12 metres above the ground, before repeating the display. Complex creaking sounds can be heard towards the end, and rushing sounds produced by the air through the tail. Some displays on the ground show the male with raised, fanned tail, in order to display the rich pattern of the tail feathers. They are monogamous. The Swinhoe’s Snipe has a zigzag flight on take-off, but then, the flight is direct with rapid wingbeats. When flushed, the take-off is rather heavy and slow, and usually silent. The breeding season takes place in spring, with the laying between May and July. The Swinhoe’s Snipe nests in scattered, solitary pairs. The density may vary from 2 to 63 pairs/km², according to the location, but it is usually heavier in clear-cuts within the boreal mountain forests. The nest is on the ground, hidden among bushes, often on slight elevated site. The female builds the nest, a shallow depression lined with dry grass. The female lays 2-5 eggs, usually 4, and only one brood is produced each season. She incubates alone during 18-20 days. At hatching, the chicks are brown-chestnut overall, with white-tipped down on back and head sides. They are probably fed by both parents. They fledge about 18-20 days after hatching. 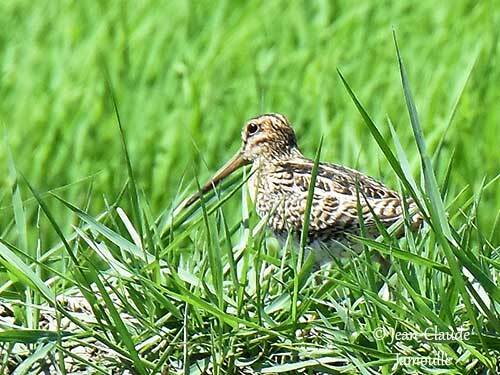 The Swinhoe’s Snipe has wide range, and except being threatened by habitat loss through aquaculture operations in the Yellow Sea, it is not globally threatened. The global population was estimated to number 25,000/100,000 individuals in 2006. The impact of habitat modification on population size is unknown. But currently, the Swinhoe’s Snipe is evaluated as Least Concern.